Glam Princess is the latest in what’s becoming a long line of sweet and floral designer perfume royalty. It’s about as competent as the other princess fragrances but at the same time suffers from a rather glaring problem. It smells really, really, really generic. In Bottle: Indistinct sugar floral, a bit of a toasted sticky marshmallow note in the bottle. Weird because the marshmallow is supposed to be a base note but Glam Princess isn’t the kind of gal to go by steps I guess. Applied: Super sweet and fruity top notes with a hint of florals. As the scent ages it digs deeper into the floral territory and the old familiar sweet foody floral from original Princess surfaces. The scent is smooth, creamy, very sweet fruity floral in the mid-stage. Not at all special or unique but it’s a pleasant enough fragrance. Glam Princess smells like a lightly flowery foody scent that, like the original, is reminiscent of cake batter. Only there’s a notable lack of the dark chocolate note in the original here. You get white cake batter in this time instead of dark chocolate cake batter. We also get sticky marshmallow that injects itself right into the teeth to save some time on the whole cavity-inducing thing. The dry down isn’t much more exciting as we get sweet floweriness until it disappears entirely. Extra: If you liked the original Princess fragrance, you’ll probably like this one because the two are built on the same very familiar formula and they do sort of resemble each other in that they’re both sweet gourmand florals. If you loved that dark chocolate note in the original Princess, though, you might want to sit this one out. I really liked that chocolate note in the original. The lack of it in this flanker just makes it smell really generic. Design: Bottled in the same heart-shaped thing as the rest of the Princess line, Glam Princess is adorned by a string of star designs on the glass. The bottle itself is a golden-yellow, the crown cap is gold with multi-colored jewels set into it. I’m still not a fan of the bottle design. I don’t think there’s anything you can do to a big glass heart to make it appeal to a woman in her mid-twenties with a penchant for simple aesthetics. Notes: red berries, guava, pear, orange blossom, vanilla orchid, ambrette, marshmallow, cashmere wood. Maybe this line of princess fragrances just doesn’t appeal to me. I can see how it’s cute and girly and stuff but the bottles just don’t speak to me and neither do the fragrances. 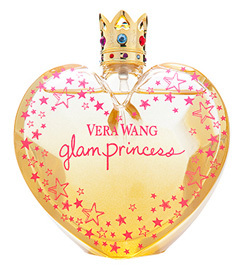 Reviewed in This Post: Glam Princess, 2010, Eau de Toilette. This entry was posted in floral, fruity, Reviews By House, sweet, vera wang and tagged ambrette, cashmere wood, flanker, floral, fruit, glam princess, guava, marshmallow, orange blossom, pear, red berries, sweet, vanilla, vanilla orchid, vera wang. Bookmark the permalink.